I’m using Yuja or Yuzu (柚子茶）again for the 3rd time. In my previous posts, I used Yuja/Yuzu to make Cheesecake (here) and Chiffon cake (here). 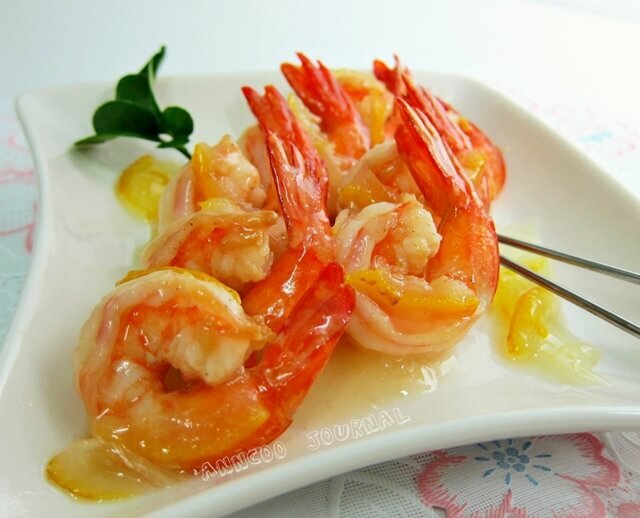 Today is an easy Yuja/Yuzu recipe Fried Prawns in Honey Citron Sauce. If you’re looking to make something special to serve as appetizer or party food but don’t want to spend too long making it then you must try to make this tangy, sweet and little sourish dish to impress your guests. Shell the prawns and make a cut along each prawn’s back to remove the intestines. Rinse and pat dry. Season with 1/4 tsp salt and 1/2 tsp ground pepper for few minutes, add the same time mix the Honey Citron Sauce in a bowl and set aside. Coat the prawns in cornstarch, then heat a wok with some oil to heat the prawns to just cooked. Drain and set aside. Cook the sauce until thickened. Put the prawns back in and toss the fried prawns to coat with the sauce. Happy Duan Wu Jie (Chinese Dumpling Festival)! Thanks Tamari 🙂 Thank you for visiting. I'm posting a link to this on my Koreafornian cooking Facebook page. It is nice to see that I am not the only person out there obsessed with yujacha. 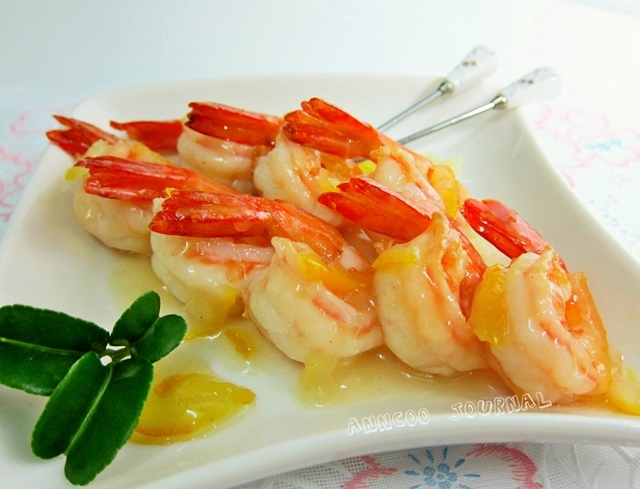 Lovely prawns with lemon, just perfect for summer! I must try them sometime soon. Daisy o Carl ~ Thank you for visiting! Jeannie, msihua, Lena ~ Thank you. Penny, Yes you must remember to get this citron tea when you're in SG. It's really nice and fragrant. Oh Nor, I saw your posting. Looks very pretty and I love the purple color. Good Job! Thanks michelangelo! I love your art work too, always amazed me! summer delight prawns! must be so tasty! Wah! The prawns look amazing. Must get Korean Honey Citron Tea when I head to SG. Oh wow.. always great to learn more about the uses of yuzu! Those shrimps are making my mouth watery .. i am super drooling out here ! Oh Anncoo, what delicious looking prawns these are! This recipe will not escape me for sure! Your photos are incredible! I always see your food most appetizing and irresistible as ever!!! Kristy, this is tea paste. Use 1 tbsp of citron tea to stir 1 cup of hot water. Hi..uuh..I always forgot your name..haha ..is Lil isn't it? You can get the Citron Tea at the Korea Sunshine shop just next to the building of PH Bencoolen. I always walk into that shop when I visit PH. You must visit this shop that you can get most of the Korean ingredients there. Thanks LeQuan! I know seafood is your favorite.. So have your tried to make tea with Yuja before? Ann, may I know do you use the tea paste or juice? Thanks for sharing this wonderful flavour prawns. Have a lovely evening. Btw, Happy Belated Dumpling festival to you. Happy Dumpling Festival to you too Ann! Wish I had some dumplings though. Almost like tangy sweet prawns! I like! Btw, where did you buy your Korean Citron Tea from? Omg! You're killing me with this dish, Ann! I love prawns and love the flavours you have going on here. Beautiful presentation as well. I've never used Korean honey citron tea in my cooking before, how interesting. Happy Chinese dumpling festival to you, Ann! Happy Dumpling Festival to you too. Hi Muimui, I think use chicken thigh better than pork or fish and this is not pomergrante 石榴, it is more to pomela 柚子. Anyway, did you receive my emails to you? Thanks Nami. I love Yuja cha very much too! Thank you everyone for your lovely compliment. Happy Dumpling Festival to you!! Very nice look prawns. I have not heard of Koren Honey Citron Tea before. Do they taste citrusy? Hi! Can i try this on meat like pork or chicken and fish as topping sauce. Coz my family cannot take seafood. I got a pomegranate tea and was wondering what to do with it. What a delicious idea! Hmm I should make a vinegreatte with yuzu to pair with some crunchy deep fried prawns. Omg, sooo inviting,impressive and highly addictive flavourful prawns..
Those prawns are so appealing! How not to salivate ….. slurp!! I just bookmarked!!! I have all the ingredinets and I'll be making this very soon. I write this as I drink Yuja cha (it's at night here and caffeine free + vitamin boost for my recovering cold). You know how much I love this right? Hehehe. I so love the prawns, it looks perfectly cooked. But I never get to make them because my husband is allergic 😛 ….Think I will have to satisfy myself seeing such pics…..
Looks really good, must be very tasty, right? Wow.. ..dish looks superb and awesome,very adorable,cariños y abrazos. Happy Dumpling day to you. This dish with Yuzu is indeed very special. Very nice!